Newcastle United striker Elias Sorensen says he was left “devastated” at how his loan move to Blackpool played out. The Dane netted 19 goals in the first half of the season for the Magpies under-23s side, which brought interest from a host of Football League clubs. It was the Seasiders who won his signature, however he managed to clock up just 32 minutes of League One action during his two-month stint, prompting United into recalling him. Read what Sorensen told the Shields Gazette about his time at Blackpool HERE. 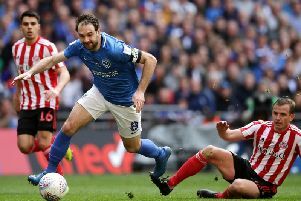 Portsmouth will rival Hull City and Fleetwood Town for Cardiff City defender Ryan Pryce, according to HITC Sport. The 20-year-old signed a one-year deal with the Welsh side in the summer after impressing at the Jamie Vardy 9 Academy. Although he is yet to make a first-team appearance at the Bluebirds, Pryce has been a regular at under-23s level. Several Football League clubs are believed to be monitoring his situation with his contract, up until now, set to expire this summer. Sunderland boss Jack Ross says there is a belief among his squad that they can leapfrog Barnsley in the automatic promotion race. With two games, the Black Cats are three points behind the Tykes following Wednesday's 3-0 win at Accrington Stanley. “We are in the position where we are having to play catch-up, it is not ideal but there is a belief in the squad," said Ross. “I said that all along and post-match Sunday that I sensed there was a great determination to take full advantage of the league games that lie ahead." Blackpool manager Terry McPhillips believes his side can end Luton Town’s 27-game unbeaten run. The Hatters are seven points clear at the top and haven’t tasted defeat in League One since October. Pool visit Kenilworth Road, where Mick Harford’s men haven’t lost all season and have won 15 of their 20 league games. Elsewhere, Southend United manager Kevin Bond has revealed Stephen Humphrys will be back in action soon after being sidelined since February. Former Peterborough United and Crawley Town manager Steve Evans is not planning a return to football in the immediate future. He would also turn down any offers to come back to manage Crawley in the future, despite previously taking the club from the National League to League One. "I have no interest in returning to football immediately and am still under contract at Peterborough United," he revealed to the Crawley Observer. West Ham United and Leicester City are monitoring Colchester United starlet Noah Chilvers, as per The Sun. The midfielder has impressed for the under-23 side and his performances have been rewarded with a senior debut in the 3-0 win against Newport County in March. The Premier League duo have tracked his progress and could be ready to make their move this summer as he is yet to agree a professional contract with Essex club. Chilvers has been offered a two-year pro contract by the U's. Colchester would likely be due training compensation if he leaves.